To the top of the four-star Hotel Drava in Harkány have installed 96 pieces of KYOCERA KD 210GH-2PU module, so their electricity bill reduced by more than 1 million Ft a year. The system started to produce on the 16th of april, 2010. Today, many hotels and local government thinks about a similar cost-saving and environmentally friendly investment. 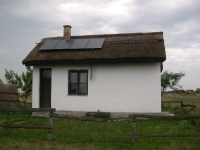 We made and had a solar network system authorized first in the district 11th of Budapest at 2003. Since that time we made the most of the solar network system in Hungary, already we are near to 100 of realized and working projects. The KYOCERA made a 18MW system in Spain, we hope that soon will be made systems like this in Hungary too. We made the first solar system of a TESCO supermarket, and we also participated in the execution all of the TESCO’s solar systems. With one exception each of them produce KYOCERA solar cell. We proud of that the won the first tender sponsored by the Europian Uninon in the area of the solar systems with the most favourable professional and economic offer and we put it into operation in 2006, for the eletrification of the Hortobágyi National Park’s farmhouses (9 pieces). We made the most of the solar network systems in Hungary, already we are near to 100 of realized and working projects. Several clients enlarged their solar system, prove the contentment with it. KYOCERA produce one of the best solar cells, and nothing prove it better than the TOYOTA set up KYOCERA solar cell to the roof of the new PRIUS. As a subcontractor we made the first 20 kW govermental system of Újbda in 2008, that was enlarged with other 20 kW in 2009, so in all 40 kW of Kyocera solar cell reduce their electricity bill. Between our Steca products in addition to the island inverters and charging controls, there are solar collector controllers and fuel cells too. Choose the best quality. You can buy several cummunication tools to the SMA inverters. At www.sunnyportal.com you can watch the systems that possess these in Hungary. Most of them were made by us. KYOCERA solar cells now are available between 16W and 235W. The polycrystalline modules of KYOCERA represent a high quality. Thanks to the new antireflection surface and the inside structure the efficiency is very high, reach the 16%. We guarantee the performance of the panels and how many electricity will going to produce the solar cell on your roof on avarage in a year. You can buy all of the solar cell products and the complementaries in our webshop. You can find everything all you need. Most of the products can be delivered from the stock immediately. KLNSyS is one of the leading solar cell companies of Hungary. Our profile is to planning, dimensioning, puting in circulation and deploying of solar systems and smaller wind turbine systems. Within it we emphasize to meet all individual requirements. The services of our company are based on the high quality products of world-famous manufacturers. The KLNSyS have the exclusive distributorship for japanese Kyocera solar cells, the german SMA inverters, and the also german Steca charging controlls in Hungary. Our products pass for leading in Europe, in addition they are all compatible, so the system that was built from them are working dependably.